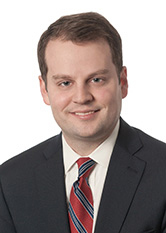 John T. Conboy is an associate in the Real Estate Practice Group. He represents various financial institutions and real estate operators in connection with acquisitions, sales, financing and refinancing of commercial properties. He also counsels landlords and tenants in the leasing of commercial space. In addition, Mr. Conboy has experience in representing clients in the purchase and sale of residential real estate, including condominiums, cooperative apartments, and single and multi-family homes. While attending St. John's University School of Law, Mr. Conboy was an Articles Editor of the New York International Law Review.